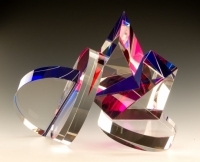 During his years as a glass artist, Michael Taylor has traveled and lectured extensively to Japan, Europe, Asia, Oceania, Africa and North America in over 80 venues. 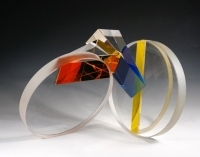 Michael Taylor’s career in higher education is equaled by his achievements in visual art and his representation in many notable collections, among which are the Renwick Gallery of the National Museum of Art, Smithsonian Institution, Washington, DC, The Corning Museum of Glass, Notojima Museum of Glass, Japan, Museum fur Kunslhaniwerk, Germany, National Museum of Glass, Holland, Royal Ontario Museum, Canada, Chrysler Museum of Art, Norfolk, Virginia, Racine Museum of Art, Wisconsin and many others. 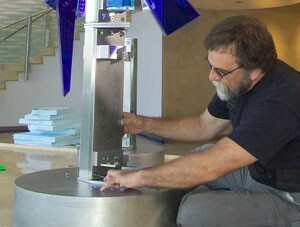 Taylor has been honored with awards and fellowships from the National Endowment for the Arts, the Fulbright-Hayes Foundation, the American-Scandinavian Foundation, the New York State Council for the Arts, the Louis Comfort Tiffany Foundation, Luzo – American Foundation, and he was winner of the Grand Prize at the Kanazawa International Glass Exhibition, Japan, He has served in an advisory capacity to the Institute of International Education, Fulbright Foundation, Corning Museum of Glass, Glass Art Society in Seattle, Washington, Illinois Council for the Arts, Chicago, New York Foundation on the Arts, Vitro Corporativo S.A.De C. V., Mexico, Assosiacao Portuguesa do Vidro, Lisboa, Portugal, John D. and Catherine T. Mac Arthur Foundation, and most recently the Bardibukk Symposium, Budapest, Hungary. For 30 years he was a professor and head of the Glass Department in the College of Imaging Arts and Sciences, at Rochester Institute of Technology, New York. He is currently Professor at the Universidade Nova de Lisboa, Faculdade de Ciencias e Tecnologia, 2005 – Portugal. Taylor has lectured, worked and exhibited in the North America, Europe, Asia and internationally in many public and private venues. He has recently completed work on a large optical glass and stainless steel commission for the Bella Mare Towers near Miami, Florida. This year he will return to Portugal to lecture at the Nova University of Lisbon.